I’m privy to the goings on behind the scenes of Doug’s sailing and it would be a shame not to share it because it’s often amusing. He left for a two week road trip to Florida for three regattas. It was to be a trip of inconvenience. Roughing it. Winging it. Toughen him up and get him in adapt and overcome mode. So he was sleeping in the car and making do. 2/11/12 - end of day 1 of Florida Laser Masters Championship - Doug calls, breathless, talking a mile a minute. Says it’s cold, 40s maybe, blowing 20 to 30, and he’s been tipping all day. He thinks he might be nervous because he looked down at the start and noticed his legs were shaking. He’s barefoot and wearing shorts. Yeah, sounds like nerves to me. Second call after de-rigging and he’s driving, looking for food. Says he’s getting old. He hit a wall in the third race. Ran out of energy. He’d only had a muffin for breakfast and they didn’t stop for lunch and sailed until 3:30 p.m. Now he’s at the grocery store and wants to know what he should buy to keep on the boat to keep from hitting that wall again. He still hasn’t eaten all day. By the time he reaches the checkout counter he’s downed 3 chocolate milks and a bagel. His sense of humor still intact, I hear him ask for a discount since there is food missing from the packages. I ask how John’s is doing. Early 40s, the picture of health and vitality. Doug says he’s walking funny and bailed on the last race. I check the scores. Looks like lots of people didn’t sail the last race. This is good. Doug hung in there. 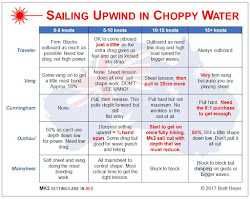 2/14/12 - end of Midweek Madness - Doug calls, better results than the last regatta. But his gloves are wearing out and have worn all the way through in several places. Says there are no stores around to get more. He’ll just have to make do. 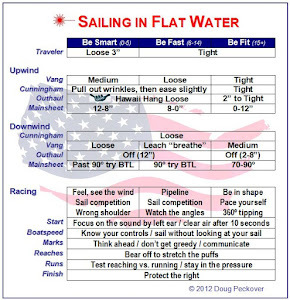 2/15/12 - end of the practice day with Luke Lawrence - Doug calls, learned a lot, feels like an amateur learning to sail for the first time. His hands are in bad shape. Skin coming off, blistered badly and he can barely move his fingers. I hang up do some checking online and shoot him the address of West Marine less than five minutes away. I call him and tell him to drop everything and go. He calls later, two new pairs of gloves in hand and he’s searching for food. He stops at Subway and I hear him order two foot longs. Healthy appetite. 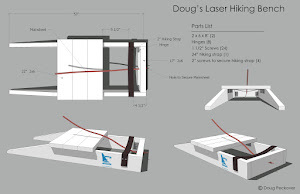 2/19/12 - end of the Laser Masters Midwinters East - Doug calls, he’s won the event and is headed home. Says he had a Jesus moment and walked on water. Actually, he tipped on a sandbar at a mark rounding and stood up in knee deep water, much to the surprise of the on-looking committee. So, I sent a 61 year old man off on this trip and back comes a guy that seems to be impervious to cold or discomfort, the appetite of a horse and who has consistently improved his performance throughout the trip. It would seem that inconvenience does indeed yield results. He arrived home looking like hell but somehow … younger than when he left.